While we were at POC last fall, I remember one hot afternoon when Brian and I were sitting in the shade and reading, because it was too muggy to take an after-lunch nap in our room. I was reading some John Grisham novel about some fancy-pants rich lawyer, and all of a sudden, I slammed my book down and exclaimed, “Brian!” Having got his attention, I told him in a voice filled with yearning, “He’s eating a bagel… with cream cheese!” (referring to the character in the book). We both stopped and thought about how long it had been since we had had the luxury of eating a bagel with cream cheese, and then returned to reading. A minute later, I slammed the book down again in frustration. “What is it now?” Brian asked. “Brian… he threw the bagel away!” I couldn’t stand the fact that a fictional character had so carelessly disposed of such a luxury! One of my first jobs when I was 14 was mixing bagels at my uncle’s bagel shop. 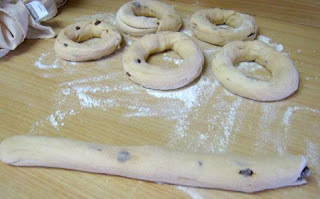 At that time all I did was dump the ingredients into the huge commercial mixer and then, after the dough had risen, I would cut it into strips and feed them into a machine that formed the bagels. 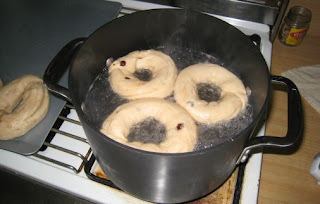 At that time I was never involved in the boiling or baking (someone wisely decided that it was not wise to trust a 14-year-old with a giant oven). It wasn’t until recently that I took up bagel-making again, after seeing that cream cheese is available in our store here (though not all the time). 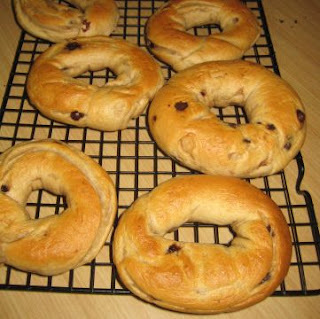 It actually isn’t as hard as it looks, and home-made bagels taste awfully good. Such lovely bagels! Thanks for a great laugh - I hadn't considered how novels might have that effect!